Person purchasing fruit in a market. In a new collaborative project with Paul Kinder of the Davis College of Agriculture, Natural Resources and Design, and using funding from the U. S. Dept. of Agriculture, Andress is diving deeper to identify the issues creating the “upstream” barriers to food access in the first place. Last fall, Andress and Kinder convened experts from across the food production system in West Virginia for a food desert strategic planning workshop. Participants were asked to think about the food desert issue in terms of availability, accessibility, affordability, accommodation and acceptability. Their workshop helped to generate a report outlining the factors that create “food deserts” or serve as barriers to food security in West Virginia. The workshop also resulted in a prioritized list of strategies that the state can consider to address its food security problems. Now, Andress and her team, including two graduate students from Davis College, are embarking on the second phase of the project. Over the next year, they are trying to understand why those barriers exist in the first place. They will be developing a food desert framework and conducting a gap assessment across the state to determine which of the factors are controlling and resulting in food deserts. Those interested in learning more can view the workshop videos online (Part 1, Part 2 and Part 3). Faced with a declining rural population and below average income, many West Virginians are left living significant distances from supermarkets and reliable food sources. Identifying this regional challenge and collaborating to determine barriers and opportunities like supply chains that will help address food deserts is an example of the challenges WV Forward is supporting. West Virginia Forward's blueprint lays out the need to improve the health, wellness and livability of West Virginians in local communities across the state in order to help boost economic stability and mobility. Lauri Andress (left) speaks with man at counter. 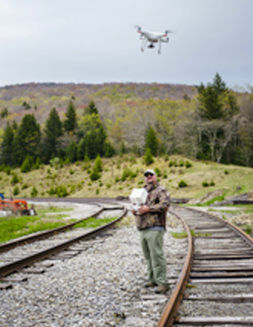 Paul Kinder operates a drone along railroad tracks.